Three + years later, our district is now 1:1 with iPads in 2nd-8th grade, and our 4th-8th graders take home their district iPads. Being a part of the rollout of this massive undertaking was enlightening. We found out early on that if we didn't set clear expectations and rules regarding the iPads, well, it wasn't pretty (especially with older kids!). They had a tendency to think that the devices were "theirs" and could do what they wanted on them. Over the past few years, and working with so many amazing teachers, our iPad rules have evolved and changed and I think we've finally found a set of rules that works for us. These rules are shared even before the students touch the devices. Teachers I have worked with will sometimes make their students act out the rules, play charades with the rules (always a fun game for the beginning of the school year), draw or sketchnote the rules, or even create songs and chants about the device rules to recite each morning. One teacher I work with even has her students go through iPad "Bootcamp" before they can even look at their devices! They earn a star for each iPad rule they can memorize, demonstrate, and teach others. Some teachers work with their classes to come up with device rules together, while others just introduce them to the students. You can see a video of me introducing our iPad rules and chant to my second grade class here. You can download these posters here if you might be able to use them with your students too! If you're looking for editable posters for older kids, you can find them here and editable posters for younger students can be found here. Now once students know the rules, the question becomes, how do we hold them accountable??? We encourage teachers to do random iPad Check Ins with students throughout the week or day using this iPad Check In Rubric that aligns with the rules above. Some teachers use this rubric monthly with all of their students and go through it whole group. Other teachers pick three or four random students each week and sit with those students to go through their iPads and fill out the rubrics together. Other teachers use that awkward five minutes before recess or lunch throughout the day to check in with students and use this rubric as a guide. No matter where, when, or how you do it, we've found students MUST be held accountable for the learning happening on their iPads, and how they treat them! This rubric aligns with the rules we created above. If the kids know the rules and teachers are going over the rules with them on a regular basis (just like with any other routine, procedure, or rule at school! ), students should have no problem with this check in rubric. You can download this iPad Check In Rubric here. Editable rubrics can be found here. 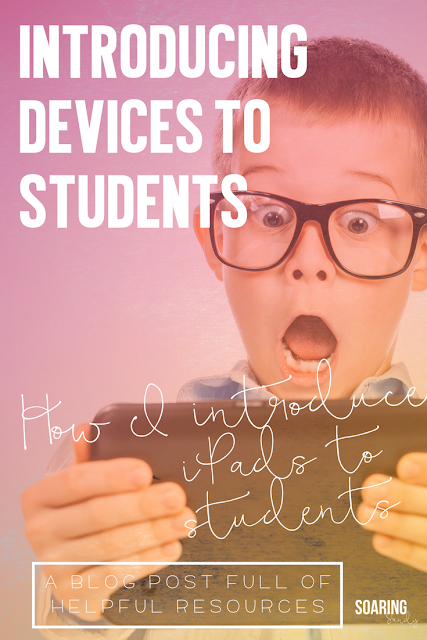 How do you introduce iPads to your younger students? Older students? And how to do hold them accountable!? I'd LOVE more of your ideas! I also often get asked about consequences- what do we do if students are not following our rules...? Another blog post on that coming soon!